In this interview you will learn how to go from hundreds of visitors per month to thousands within a few months, impress journalists so they naturally want to write about you, and learn how to leverage Quora to build these relationships in combination with a common sense email hack (that nobody uses), tune in now! Dmitry is the founder of Just Reach Out, where he and his team help small businesses, startups, entrepreneurs pitch and get press coverage from journalists and influencers who are interested in their niche. In 2016 he built, launched and used PR outreach to grow JustReachOut.io from 0 to 2000+ paying customers in 8 months using PR outreach and content marketing. In 2015 he used PR outreach to grow his personal blog form 0 to $150,000 in revenue in 1 year. From 2012 to 2014 he used PR outreach to grow the startup from 0 to 40M pageviews before the company was acquired by Google in Sept 2014. From 2009 to 2012 he worked at ZURB.com as the only marketer where he used PR outreach and content marketing to grow their daily traffic on site by 10X and their Domain Authority from 13 to 83. From 2007 to 2009 he worked at Crossloop.com where the founder and he used PR outreach to grow the startup from 0 to 5M active users before it was acquired by AVG in Sept 2012. How did you become a pR Expert? I was part of a MBA program and the very first week I was in Silicon Valley I met an alumni. He was starting a startup. I decided to join. I did not know a thing about startups at that time. I worked for free for a very long time and my mentor taught me a lot about PR. That was his thing. He was the founder and he was into building relationships. He was number 20 at LinkedIn and we did really well. I followed his advice and he guided me through the whole process. That’s how I figured out what to do. I learned how to build relationships with journalists, how to pitch journalists. That was the kind of marketing we focused on. As a result we grew company to 5 million customers in less than a year. And within two years it was acquired. I left and worked for another startup before the deal was done. All the time I learned a lot of things from much smarter people than me, especially how to build relationships, how to get publications to cover you, how to write for blogs and get publicity. And of course how to translate this publicity into customers. Eventually I worked for another company where I managed to grow our page views from zero to two million page views in about two years in 2014 before the company got acquired by Google. That’s when I went on to build my own startup. I decided not to join Google and leave. Instead I built my own company in the PR space. Public relations has been with me through the whole journey from being an unhappy engineer moving to Silicon Valley and now running my own startup that has about 5000 customers who are using or have used our platform in the last three years. What’s the number one rule for somebody starting out to build relationships with influencers online? When I just came to Silicon Valley I did not know anybody. When I worked at the startup I did not know anybody. My mentor told me you have to build relationships with people. And the only way I knew to build relationships is to start talking to them with the intention to give value upfront. That naturally has to be individualized. I always imagined myself at the conference and sitting next to somebody who is well known. Somebody you want to start a conversation with. Usually I Google them and try to find what they said on social media so I can respond to something that they said. If you know something about that person you can give little bit more insight into whatever they were saying. It’s easier to do that now with the web because everything is so connected. You can mention what they talked about or answer a question. You can give them a shout out and mention them. It’s much easier to say “Hey, I just gave you a shout out” and gave you a bit of exposure for what you are doing. Without the web this was a bit more awkward. This is the type of relationship that I usually like to start with. I always think how can I impress them to a point where they will ask me what I do. That was a big lesson learned for me. A lot of people forget that we always ask ask ask. e are not executing on all those tasks. We don’t have time to do these little things that provide value. “Hey you don’t know me but I see what you are doing and maybe you can promote me? Maybe you can do something for me? This is usually a poor way to start a conversation. Of course, I have been guilty of this and most of my customers are guilty of this. This is why we changed our service. Instead of just using our software we connect them with one of our PR strategists. They make sure that our customers are giving value upfront. As you can imagine, this is a very hard. Just before this interview there was a customer, whose company recycles waste from sunflower seeds. When they press the seeds to produce sunflower oil all the stuff that is left over is usually thrown away. This company takes the waste and they make snacks from it. This snack has more protein then meat. It’s healthy for you and good for the environment, too. Of course, this was not working. Instead we created a competition and pitched a story where people submit their recipes on how to use this material to create different types of food. You don’t just have to create snacks like chips, maybe you can create cereal out of it, or some other bars. So this competition started to draw interest. It was very interesting to see what people would make from this material. It was pretty much value upfront for the people who were participating in the competition because they were giving away this material for free. It was a lot of work to create the challenge and to recruit people into it. But once they had people participating in it, it has become a PR story, that they could pitch. This story is interesting to journalists who are covering this niche. It’s just one example of providing value upfront. Another example is this podcast. You create direct relationships with the people you interview and the people who are listening to it. How Are You Able To Write, Publish And Pitch Four Articles Per Week ? You can find all the articles on my website because I cataloged all of them. They are categorized by different types of articles. The 1400 articles in the last 7 years that we are talking about consist of different types. I have a team of five writers that work for me. They write for me as guest posts, that’s one portion of those 1400, a huge other one come from my clients. These articles got picked up by somebody else and that got picked up by someone else. For example I might pitch an article to a blogger. Then he would write it and somebody else would cover the same thing and would link to the original article. The 1400 articles include all of them. Of course, I cannot write that much on my own, not even with five writers. Probably not all of them are amazing but it’s close. You have to do it and everything that I was able to accomplish in the past was the result of providing value upfront. I ask myself: "How can I be most helpful to that journalist?" Maybe it’s promoting their article. Maybe it’s spotting a mistake or maybe it’s just starting a thoughtful conversation with them. How Can You Leverage Quora To Build Relationships with Journalists? First you need to find an article that is very interesting to you and your expertise. That means you know a bit about this topic. Then you go on Quora and find a question that is more or less what the journalist has written about. Make sure the question has some answers in it. Then you answer the question and your reference the journalist’s article in the answer by giving them credit. Try your best to write a really good answer. You can take your answer and submit it to Inc. magazine, or Forbes magazine, or Newsweek. All of them index these types of things. However, it has to be written in a specific format. There’s a whole process there and we help our customers through that process. Hey, I just gave you some shout out. Did I do you justice? It’s usually nice for the journalist to see that, so you might start a conversation with him this way. If you want to be innovative you can link your own blog in the same answer. Then you reference them in your own blog. If you do it this way you are promoting your own blog, and at the same time you are promoting them. I would reference my own blog but I would reference the section that talks about their article. So in Quora, you are promoting your blog and the journalist at the same time. This approach is a bit sneaky and more complex to execute. If we you want to keep it simple reference them directly in Quora and email them. There is a lot of other things you can do with SEO, but this trick really works. How Can You Leverage This Relationship Hack? You have to cherry pick the people you want to build a relationship with. Make sure that they are from well-known publications, people that you really admire. Don’t do this with everybody. Try to go after two or three journalists and built your relationship there. See what kind of results you can get and if you are getting the exposure you were looking for from that publication. Start there, but don’t make this the only thing you do. If you are using Quora, sometimes you just pick the right answer and you do really well. I mention your success story, where you got 1 million views in one simple answer with all my students. The same happened to another student who used reddit. She got featured on the home page of Reddit. She caught a thread that got poor answers, wrote something and then it got traction. What Is The Most Important Thing When Try To Reach out to An Influencer Via Email? You have to read the email out loud before you hit the send button. Before you sent an email, read it out loud to yourself. Ask yourself if you would respond to it? Would you say this out loud in a conversation? If the answer is yes and you are 100% comfortable that you would say this out loud to this person and not feel ashamed or uncomfortable then send it. Nine out of 10 times it’s usually not something you would say to that person. Why would you put this into writing? You don’t because it’s usually a bad idea! You look for common ground and provide value upfront and impress the other person. Which Software Do You Use to reach out to journalists? I use MixMax in Gmail which lets you see if somebody opened your email. That way you can see if your subject line is good. They see that nobody is responding. That’s my they want to send more emails. Send your email 10 times and test how many people are opening it. If nobody is opening your email you need to work on your subject line. If everybody is opening your email but nobody is responding you have to improve the copy. Use Mixmax or a tool like Ninja Outreach, to see if people are opening your emails. Let the data be the judge of what you need to do next. Do you need to improve your subject line? Or do you need to improve the email copy? Or do you need to improve the whole pitch itself? You do not want to amplify a thing that is not working on a very small scale. Where Do You See Entrepreneurs Wasting A Lot Of Time When They Try To Promote Their Business? I see a lot of entrepreneurs try to use Facebook ads. They don’t know that need to have $20,000 to test and run experiments with and another $20,000 or $30,000 to really run the campaign. A lot of times this is what it takes to run ads effectively. Of course, you get people to sign up with a smaller budget, but to really make your ads work you need a bigger budget. You need a really good funnel on your homepage and your landing pages. I see people jumping to ads with 500 or 1000 bucks hoping to get good conversion rates because they hyper- targeted their audience. For Facebook you will probably need a lot more to really test. You really need to work on your conversion before you even start advertising. Real people that you have not paid to advertise for. I see a lot of people trying to get exposure through ads but their conversion is not working or their product is not working right or they are on a budget and should use the budget more wisely. A lot of people do partnerships and affiliate deals. That’s nothing I have gone into because affiliate deals never worked for me too much. You have to invest time to write the copy, maintain the relationship and do the work for your affiliates. This can be really time draining. There are many businesses that exist because of affiliates but as a business starting out you can get exposure by working with your first customers. You can use their stories to get exposure. Being tricky with ads is usually not the best way of building relationships. Doing affiliate deals where somebody is emailing their user base to promote you for some percentage of money is nothing I support. Try to imagine someone on the street with an ad trying to be funny and then sell you something. This is probably not the way to build a relationship with your first customer. It’s the same for some shady dealings where somebody says I introduce you to a bunch of customers. On the other hand imagine you speak at a conference and talk about something really interesting. Then somebody comes up to you and says. What do you do and how does this really work? That’s how you get the customer who truly understands what you do. Online marketing is a huge industry and they’re probably making investments and money. It’s just that I feel for small businesses who are just starting out, it’s very easy to get mixed up in ads. Maybe there are other ways of doing things that are not so capital-intensive. Of course even with ads you always have to put so much money and some things. For example you can do Google ad words and pay pennies for some of these keywords. I’m not saying don’t do ads. Think about where you want to put your dollars, especially if you are a small business. You want to make sure you invest your money wisely. I have been bootstrapping on my life. I have never taken a dollar from an investor because their mentality is very different from mine. I liked lifestyle businesses. I do not want to 10 X my money in the next 10 years or thinking about getting acquired or sold somewhere. It’s a different thinking that you sign up for when you take money from investors. It’s always a tough question where to spend money but this is a place where I see where we young businesses wasting it. PR and building relationships is free. I believe entrepreneurs should use this opportunity much more because it’s helpful and works. What Creates the Most Stress When You Try to Build A Business from Scratch? Then you look back one or two months find out that you’ve been running around. If you have a small company you don’t have a huge team. You don’t have big board meetings and this stuff. It’s useful to come back to the purpose of what you are doing and figuring out how you will measure what you do month to month and week to week. Is it the number of subscribers? In my case it is monthly revenue. Then see how your actions impact that number. In your business is might be something different. Have a goal that you are going to and all your actions should be aligned to that goal. Everything you are doing has to be driving that goal. I think it is important because it is so easy to get lost again. Keep reminding yourself about that goal and don’t’ forget to provide value first before pitching your company. What This The Number One Tool You Use To Stay On Track In Your Business? I was using a goal setting plug-in from Brian Harris. All it does is showing you that number because it’s connected to your dashboard. For me it used to be email subscribers. Now it’s monthly revenue. Of course, these two are correlated because the more email subscribers you have the more money you will make. The plug-in was connected to active campaign. Now I look at the matrix in active campaign because there’s one metric that I highlighted. I look at that every week, so I see how my monthly revenue is changing. The goal setting plug-in from Brian Harris used to be really helpful because every time I open a new tap in my browser this metric was showing. The name of the plugin was LIST-Goal. What’s the number one tool to be productive and stay focused? I got FindFocus from you and keeps distractions away from my machine. I’m pretty good with focus actually. For example my phone does not have anything on it. I can show it to you. There are no apps. I don’t even have text messengers on my home screen. There is no email on my phone. All I have is just calls, Google maps, the camera, an app for music and dual mobile, which is my two-factor verification tool, which you must have. I cannot even access email on my phone. Besides that I’m using Inbox When Ready. When you click on it, the software shows you all the emails in Gmail, so you do not see your inbox. I do not want to see my inbox because it is usually a giant mess. It is the world’s to do list for you. If you open up your inbox it shows you what the world wants you to do. Of course you have your own plan. But that plan gets put on the back burner. All these burning questions and problems and issues in the world come at you through your inbox. What’s The #1 Thing That Leads To Procrastination And Overwhelm For Entrepreneurs? You always want to see what other people are doing. You see fancy websites, how a company created traction, you see their growth numbers. Maybe someone raised $30 million or $40 million and a startup has 50 employees and next year they have 150 employees. And you simply started with your 60 customers and next year you’ll have 160. You are looking at these bigger companies in your field and want to be like them. These people make things happen. They are moving icebergs. They are not any farther along than you are. You just have a different approach. A lot of entrepreneurs try to imitate bigger companies and try to do what they do. This kills your self-esteem. Somebody who raises went to capital needs to hire more people. Of course, they need to account for them so they create more stuff. A lot of entrepreneurs try to imitate bigger companies and try to do what they do. They try to copy their service offer, copy their metrics, their growth process and their strategy. There are so many of these articles out there on how to get your first 1000 customers and how to get your first 100,000 customers. How we hacked a referral program to get tons of users, how we increased our conversion rate by 100%.It might have worked for somebody else.It will probably not work for you the same way. Just because it worked for somebody else usually does not mean it will work for you. Don’t implement what somebody else has done. It’s just what somebody else has done. It’s great that it worked for them. 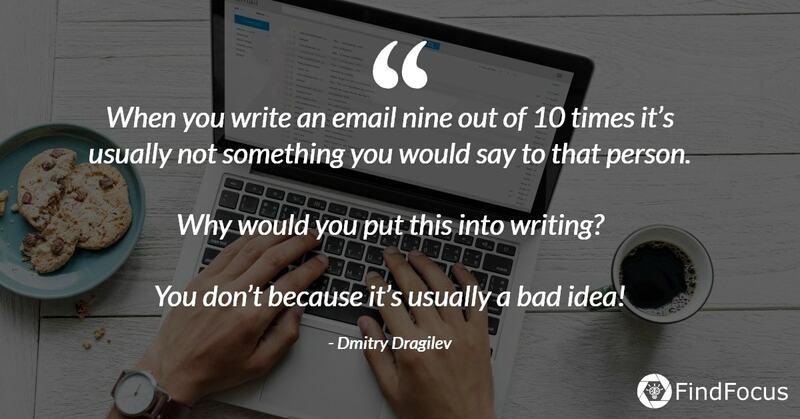 I’m guilty of this because I use email all the time. I am waiting for responses or only communicate via email. Because of that I want to be very fast in this area and keep it to inbox zero. However, inbox zero might not be the right approach. It just makes you feel good because nobody is waiting on you. At the same time it does not mean that you are productive. Even if you forget to follow up with somebody important it will make you more productive if you do not answer every single email. At the same time I need to work on the actual product itself, like the search algorithm. If I’m using Facebook or Instagram and read all those comments on my posts and answer them I feel good about it. But when I finished that most of my day has gone by and I have not worked on my software at all. So, I always come back and asked myself what is driving my revenue? One conclusion might be that I let my goal of inbox zero go away.
" An effective method that is recommended and used by Cal Newport and Dan Ariely is to prequalify you the emails you get. It means you make it more difficult for people to reach you for example by adding a contact form where you ask people what they want. Do they need a response? How fast do they need a response? You filter the incoming emails before they reach your inbox. Another method to keep your inbox clean is to unsubscribe from all your emails or create a different email for newsletter subscriptions." Learn more about how you can improve your results with building relationships with case studies, and more at Criminally Prolific.